The Soviet Union dominates its first Winter Games. Over 800 competitors from 32 countries took part in the Seventh Winter Olympics at the alpine resort of Cortina d’Ampezzo. 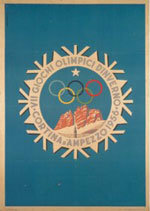 The Soviet Union entered a Winter Games for the first time and did exceedingly well. The 30 km Nordic for men and the women’s relay were new events. Norway had a painful fall from the success of four years earlier. Fierce criticism followed the four medals -- there had been sixteen at Oslo in 1952.